Buying a home to build equity is one of the main financial reasons for prospective home buyers. Another is about freedom. You can paint the walls whatever color you want, add a deck or patio, and park in your own garage. Here are a few buying vs. renting points to consider when deciding whether buying vs renting makes better sense for you. Renting is simple and you don’t have to worry about being tied down to a place for too long or having to stress about maintenance or homeowner’s association fees! Here are a few reasons why you may want to rent vs buying a home. What you may not realize, is that you are essentially paying for someone else to own the property you rent and throwing your own money away when you can invest it for yourself. In the below chart, you will see the comparison of a renter vs. a homeowner over a seven-year period. Flexibility – Renting allows you to get familiar with an area before making the longer-term commitment of buying a home. Maintenance – When a toilet breaks, you call the landlord. Job – If you think you might need to move in the near future, you may want to rent. Income – If you expect a pay hike or cut, that can impact your ability to pay a mortgage. Utilities – In some cases, utilities such as water, garbage, and heat are included. Bad credit – Creating a history of on-time rental payments can help build the credit you’ll need to qualify for a mortgage. But there is a downside, you may not have control over the fluctuation of your rent. The average renter generally starts out paying approximately $800 per month and the rent has an annual increase of 5%. In this scenario, the homeowner purchases property for $110,000 and has a monthly mortgage of $1,000. 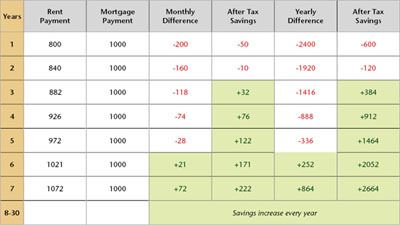 After just 6 years, the homeowner’s mortgage payment is less than the renter’s monthly payment. You can get more information on the buying vs renting comparison at realtor.org. Equity – When you pay rent, you are paying your landlord’s mortgage. When you have a mortgage on your home, you increase your degree of ownership with every payment. If you intend to stay in your home for at least five to seven years, the cost of purchasing a home is more likely to be offset by accrued equity and increased housing value. You are also able to borrow against your equity in the home. If interest rates drop, you can refinance your mortgage at more favorable rates. Tax deductions – You can deduct mortgage interest as well as your property taxes. If you work from home, you may be eligible to take deductions for a home office expense and deduct a portion of your utilities. When you sell your home, the IRS won’t hit you with a capital gains tax on the profit if you meet certain requirements. Maintenance – If you live in a house, you can decide about the maintenance, either doing it yourself or hiring your own contractor. If you live in a condominium or townhome, you may pay a monthly fee to have maintenance work covered by the association’s contractors. With the tax savings of home ownership, the homeowner’s payment is less than the rental payment in just 3 years. We have pointed out various reasons for buying vs renting a home. As you can see from the information listed above, buying vs renting has tax advantages and home equity savings advantages. We find that most people rent because of a previous foreclosure, job transfer or flexibility. If you are interested in purchasing a home or renting a home, contact Wenzel Select Properties at 630.430.4790 or fill out the contact form to send us your information.